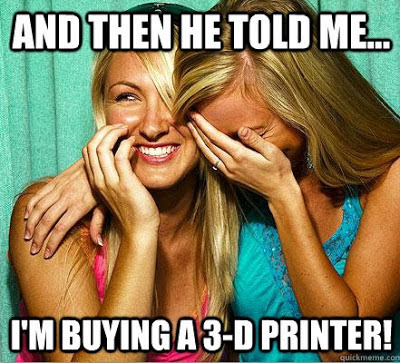 With all the hype around 3D printers over the last year, it's time for a reality check. This article on Gizmodo, written by the founder of a 3D printing company in London, highlights the many obstacles to creating items using CAD and 3D printing technology. It confirms what many of us suspected when we first heard about 3D printers...that the learning curve in mastering the technologies will be steep, and the expertise required to produce products that will stand up to the close scrutiny of scale modelers will take a good deal of time and experience. I hate to be a Debbie Downer, but I don't think we'll see 3D printers being used by the average modeler for a long, long time. But if I want my favourite book on my Kindle or iPad, I don't buy a physical copy and manually type in each word into a computer, then do all the conversion work, then send it to my device. I let a manufacturer (Amazon) do that, pay them and download the end result. Modelling will be the same - the model companies will still design and sell kits, we will just download them and print the out ourselves instead of going to the shops to buy them. Some of the folks over at the Kampfgruppe 1/144 forum have been using companies like Shapeways to print their CAD files for a year or two now, so the technology is already at least somewhat cost-effectively accessible - as long as you know CAD. I do remember reading a lot of gripes about the surface finish being rough and a lot of work to sand. There was also an article in Railroad Model Craftsman within the past year or so, where the guy needed a certain type of passenger car clerestory-type roof that would have been a bearcat to scratchbuild. Luckily he was CAD literate, so he got it printed up. On the model it looked just as good as anything wooden or injection molded. I think Vince's scenario is probably exactly what at least a part of the scale modelling hobby and hobby industry will look like in maybe a couple decades from now. Home printers sound like being a long ways off yet, but the technology is still in its infancy and somebody will make that a reality somehow, someday. Great perspectives, guys. It's going to be intersting to see how these technologies affect the hobby.